According to a report on www.chinadaily.com.cn, China's first aircraft carrier finished its sea trials this weekend, and returned to port in Dalian. 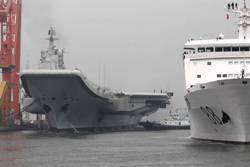 The carrier nicknamed for now "Varyag" when at the Black Sea Shipyard in Ukraine, broke through a thick fog and appeared about 3 km east of the docks of the Dalian Shipbuilding Industry Co Ltd, which refitted the ship, according to the Beijing-based Mirror Evening News. At least seven tugboats guided the vessel to the dock, the report said. Media reports cited unidentified military sources as saying that the vessel is supposed to be handed over to the People's Liberation Army (PLA) Navy around August 1, 2012, which will be the PLA's 85th anniversary.